SAN BRUNO, CA, September 17th, 2018, GREEN CREATIVE, the commercial grade LED lighting manufacturer proudly announces the selection of 5 products by the Illuminating Engineering Society (IES) for the 2018 Progress Report. These high-performance LED lamps and innovative luminaries provide quality solutions for a variety of new construction, remodel and retrofit applications. The committee selected the CREEN CREATIVE PAR30 HO and PAR38 HO lamps which provide industry leading lumen output, candela and efficacy from a CRI 90 source. The full-faced optic is available in spot, narrow flood and flood beam angles. Both lamps are enclosed fixture rated and come with a L70 lifetime of 50,000 hours. Joining the PAR lamps in the 2018 Progress Report are three innovatively designed LED downlight fixtures. 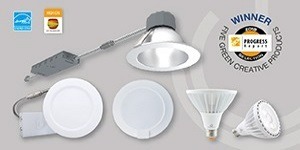 The THINFIT EXT 277V family delivers up to 1800 lumens from a shallow downlight. The wet location, ICAT rated family comes standard with a 120-277V universal voltage, 0-10V dimming driver and metal clad cable for the most demanding commercial plenum applications. The CLICK with sensor downlight is honored to be the first surface mounted 6-inch downlight with an integrated PIR sensor. Perfect for closet, pantry, other small enclosed locations. Finally, the SPECFIT downlight family rounds out the fixture selections for its industry first combination of field-selectable lumen outputs, interchangeable optics and multiple trim sizes and options in a specification grade retrofit downlight. The PAR30 HO and PAR38 HO lamps as well as the SPECFIT and THINFIT EXT 277V fixtures are available through GREEN CREATIVE distributors and are shipping from the company’s west coast, central and east coast distribution centers. The CLICK with sensor will also be available by the end of the year. For more information on where to purchase these products near you or how to become a distributor, please contact GREEN CREATIVE at: [email protected] or (866) 774-5433.